Can We Fix Charities in the U.S.? 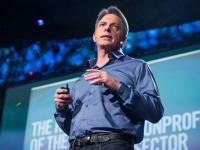 Dan Pallotta, is a father, activist, and fundraiser who is speaking out against the current way that nonprofits operate. In March, 2013 Pallotta presented a TED Talk that passionately discusses how to change the way we think about a charity. He identifies a double standard—where too many nonprofits are rewarded for how little they spend and not on what they get done. Nonprofit employees should be able to earn larger salaries thus increasing nonprofit’s competitiveness with the private sector to attract and retain top talent. Spending a lot of money on fundraising is good investment if it leads to fundraising success. Overhead costs are not a valid metric for evaluating quality of work. Based on this reasoning, Pallotta supports the notion of increasing salaries for nonprofit leadership as a way to attract and retain top talent. Yet, should we query whether it is a real issue for nonprofit fundraisers? According to the New Rutgers-Camden research, donations decline as nonprofit executive salaries rise. Pallotta also challenges the assumption of equating frugality in how a nonprofit operates to ethical probity. He raises the larger question—what if we start rewarding nonprofit organizations for their big accomplishments despite the price tag? Clearly, we have not adequately solved our larger societal issues that charities are currently addressing, like ending homelessness, poverty, hunger, or a lack of drinking water. According to the organization Stop Hunger Now, a child dies from hunger every six seconds. Palllotta argues that we will need a big idea and achievement to end hunger in our lifetime. What price is ending world hunger worth? However, Shackford (2013) notes that Pallotta does not address the difference in public versus private spending on aid for the needy. According to Connell (2012), about 70% of private donations reach the target populations, whereas, in public aid programs, only 30% funding reaches the needy. Shackford states, “much government aid spending gets consumed by bureaucratic ‘overhead’ and asks if it would be acceptable for only 60 percent of private donations reaching the needy, if the end result also improved charitable giving to 3 percent of GDP?” The assumption seems if the charity increases spending on overhead and people it will add to its bureaucratic cost while yielding only a marginal return to the organization. Koenig (2013) identifies two opposing schools of thought in philanthropy that Pallotta’s TED talk highlights, the “pie growers” and the “pie givers”. The pie growers are those who believe the pie, i.e., the money in the nonprofit sector, can be grown if nonprofits act more like businesses and invest in developing their organizations. In contrast, the pie givers believe that more of the pie needs to be given directly to the people in need and not spent on organizational overhead, like marketing, data management tools, or social media. Chaplin (2013) agrees with Pallotta’s assessment that the nonprofit sector is being kept small because of the closed-minded thinking about compensation, marketing, risk, time, and profit in the sector. However, Chapin emphasizes that it is the nonprofit’s risk aversion that needs to be switched if it wants to get anything meaningful done. Donations are the life blood for many nonprofits and changing their approach to fundraising will not be easy. Nonprofits face decreases in individual giving which accounts for 80% of total charitable dollars. Combining this with additional government funding cuts because of the sequestration in the United States leaves many nonprofits scrambling to find additional funding sources or risk cutting services, staffing, or both. What seems clear is the nonprofit community needs to embrace more changes to the funding landscape and begin to re-evaluate some of their commonly held assumptions. In the introduction to his 1996 book, Evolution Guided By Design: A Systems Perspective, Bela H. Banathy states, “the greatest source of change in social systems is the process of learning.” The nonprofit community is evolving and if it can embrace an evolutionary humanistic learning approach it would be able to meet multiple needs throughout the organization and community. Most who work in non-profits are genuinely motivated by altruistic principles and they dedicate their talents and skills to address a societal need. Their dedication creates the opportunity for nurturing work environments to evolve, and are ideal for learning and growing. Banathy describes how evolutionary humanistic learning supports multiple ways of learning from the individual learner being guided by others, or self-directed learning, learning by discovery, to team learning. Providing a cooperative and trusting work environment that is transparent and supportive of risks and failures can foster learning on multiple levels. Of course, we all fail at times. The point is to minimize the failure and learn from it. The worst type of failure is the one we do not learn from and therefore repeat! Perhaps the real challenge is how can these charities create supportive work environments that enable the employees to rise to meet the organization’s mission and vision and take risks? The world continues to change and nonprofits need to be flexible and adapt to these rapid changes. Social media has revolutionized the world and how people interact with one another. Nonprofits cannot afford to miss out on innovating with their methodologies to maximize every resource to accomplish their missions. I believe Pallotta’s ultimate goal is to help transform the way we think about changing the world through charities and community service. Is our society discouraging our non-profits from dreaming big? What are some of the values and assumptions that nonprofits adopt that might limit their ability to shift to a new way of operating? How does an organization know when it should put its efforts into a process of change? How do we know that the system is unable to change? How do we know when we need to change the system?